JPMorgan Chase & Co.'s sole location in the Washington area is on the ninth floor of this building across the street from the White House. The office is not open to the public. 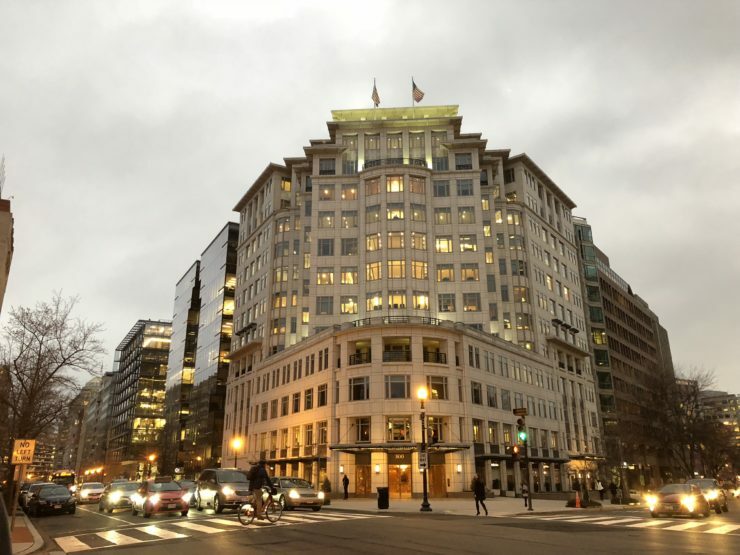 Across the street from the White House is the U.S. capital’s only outpost of the nation’s largest bank – tucked away on the ninth floor of a grey stone tower. But the office is not open to the public. Stop by and security will turn you away. And while the bank has a team of professionals designed to serve the district’s rich, it is not technically a branch. So, in Washington, Chase doesn’t have to abide by the Community Reinvestment Act – a 1977 law designed to reverse the legacy of redlining, or racial discrimination in lending. The law requires banks to lend in low- and moderate-income areas only if they have a branch in the area that takes deposits. And so, even though Chase rarely lends to low-income residents or people of color, who make up a majority of the region’s population, it is not breaking the law. Chase is one of the biggest lenders in the Washington area. Yet African Americans received just 23 of the 1,119 conventional home purchase loans Chase made in the metro area in 2015 and 2016, according to government lending data reviewed by Reveal from The Center for Investigative Reporting. Latino borrowers received 35 loans. An analysis of tens of millions of mortgage records by Reveal found 61 metro areas where people of color were significantly more likely to be denied a conventional home purchase loan than whites, even when they made the same amount of money, sought the same loan size or tried to buy in the same neighborhood. The Washington area was the only one where Reveal’s analysis found statistically significant disparities for all four ethnic groups studied: African Americans, Asians, Latinos and Native Americans. Chase had one of the highest denial rates for African Americans and Latinos among major lenders in Washington. The bank turned away 26 percent of African Americans and 18 percent of Latinos who sought conventional home purchase loans in 2015 and 2016. It denied 7 percent of applications from white homebuyers. Not having branches in the district, advocates say, also skews Chase’s applicant pool. She said Chase would comply with the Community Reinvestment Act in each of those cities once its branches are open. “Trust offices by their nature are not deposit taking, do not meet the definition of a branch under CRA regulation, and are therefore excluded from the bank’s assessment area under the regulation,” he said. Reveal’s analysis of Chase’s lending shows the bank made a much smaller percentage of loans in low- and moderate-income census tracts in the Washington area than the industry as a whole. Chase made 8 percent of its loans in those kinds of neighborhoods – where banks normally are required to solicit depositors and clients under the community lending law – compared with 20 percent for the mortgage lending industry as a whole. The same pattern was present in Boston and Philadelphia, two other cities where Chase maintains a trust office that makes loans to the rich, but no retail branches that trigger enforcement of the Community Reinvestment Act. In both cities, Chase made an overwhelming percentage of its loans to white borrowers. In Boston, it made 6 percent of its loans in low- and moderate-income areas. In Philadelphia, that number was 4 percent. Chase’s lending patterns in the Washington area were whiter and richer than the biggest banks with many area branches. In its headquarters city of New York, where Chase has more than 600 branches, the bank’s share of lending to low- and moderate-income neighborhoods was almost twice as high as in Washington. In the Washington area, Chase concentrated its lending in affluent white neighborhoods – such as the district’s Chevy Chase, American University Park and the Rosemont section of Alexandria, Virginia. But Chase rarely made loans in higher-income African American neighborhoods, including middle-class Woodridge and Prince George’s County, Maryland. The comptroller gave Chase a satisfactory grade under the Community Reinvestment Act in its most recent assessment, released in 2013. The bank was not unique in that regard. Over the past five years, the federal banking regulator has given 99 percent of banks satisfactory or outstanding reviews under the law. The website for Chase’s Washington office includes pictures of five senior employees, representatives of its J.P. Morgan Private Bank brand, smiling in suits and ties – all of them white. “She and her team help high-net-worth clients grow and sustain their wealth across multiple generations,” the website says. Reveal sent emails to Perrins and three other employees at the office but received no response. When Reveal called a local phone number for that Chase office, the call was connected with an operator at a call center in Chicago. Reporter and producer Amy Walters contributed to this story. It was edited by Amy Pyle and copy edited by Nikki Frick.